The Workers Communist League, through its several fronts, placed huge emphasis on Treaty of Waitangi propaganda. If Maori nationalism was to be exploited for its revolutionary potential, non-Maori NZers would have to be "conditioned" to accept radical demands. NZ's founding document, the Treaty of Waitangi would have to be turned into a propaganda tool. In the early '80s the WCL front "People Opposed to Waitangi", played a major role in the Waitangi day demonstrations of that era. POW claimed that the Treaty of Waitangi had been used to defraud Maoris of their land and heritage and consequently promoted the slogan "The Treaty is a Fraud", . After a while however the WCL twigged that there was more mileage to be gained in calling on the Government to "Honour the Treaty"- to restore to Maoridom the alleged sovereignty "enjoyed" by the tribes before 1840. 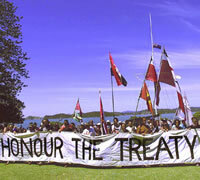 Consequently the slogan was changed and "Honour the Treaty", became the new rallying cry. That slogan is still in use today and is mindlessly repeated at virtually every Maori demo, march, rally, "hikoi" or sit-in in the country. In 1985 several WCL influenced organisations, including NZUSA, YWCA, National Youth Council and the Clerical Workers Union, joined forces with socialist church groups and other Marxists to form a new organisation, "Project Waitangi". Taxpayer funded and sponsored by then Governor General, Paul Reeves, Project Waitangi (now Network Waitangi) ran extensive "education" programmes in schools and businesses all over the country . "Honour the Treaty. Increasingly this call has become a focal point of the growing movement for Maori self-determination. It is no vague slogan, but is the underlying theme behind a series of specific demands being raised in struggles concerning land, fishing rights, language, the media, social welfare services, education, church institutions, unions, local government and so on. In short, it touches almost every area of life in Aoteoroa. Organisations such as the WCL, which are active in many spheres of struggle and which are committed to developing a genuine revolutionary process, have a responsibility to defend and promote the struggle for Maori self-determination. This must include taking up the battle for the Treaty of Waitangi to be honoured, and challenging racism where-ever it appears." Several WCL aligned individuals worked for Project Waitangi, including Rona Bailey, who worked in the organisation's head office, for several years in the late '80s and '90s. During the 1984/90 Labour government, state agencies were required to adopt a "bi-cultural approach" and require staff to undergo "training" in Treaty related issues. Project Waitangi and several of its offshoots made (and still are making)good money lecturing educational, business, governmental and charitable organisations on bi-culturalism, Maori "cultural sensitivity" and similar forms of "education". Ironic-Marxist racial propaganda, force fed to hundreds of thousands of NZers, enabling leftist radicals to make capitalist incomes at the expense of the taxpayer. Good onya Trev. Pesky Maori . What happened to the good old days when they were happy with a pat on the head?